Bored of the same old meal? Have a look at our Christmas Dinner reimagined through our French chef and enjoy the sights and lights of London at Christmas from the warmth of our bus. 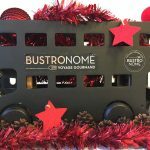 Come and dine with Bustronome – a brand new and unique concept to London, where guests enjoy fine dining as you travel in style around London’s major attractions and landmarks aboard the top deck of our hi-spec, glass-roofed bus. The bus itself has a maximum capacity of 38 people all seated on the top deck of the bus, giving every guest a 360° view. The downstairs is equipped with the guest toilets, cloakroom and kitchen. Whether you’re looking for a romantic meal for two, or an office party for up to 38, we’re the venue for you. We can come to the doors of your premises or your building, to make the surprise complete! We create our menus carefully, composed solely of fresh produce, which can be fitted to individual tastes. We offer a wide selection of wines and spirits that accompany the proposed menus. You can choose! Book early to avoid disappointment and let’s make this Christmas one to remember for all the right reasons! The menu cards and the colour scheme of the Bus are all yours to make your event unique.There is also musical entertainment and photo/video documentation on request! When can I book out the Bus? *Our packages are for information only. For a privatization, please contact us on +44 (0)20 37 445 554 or by email for a quote for your event.